This classic recipe was shared with us by a reader back in 2006. For a refresh, we've given the recipe an edit and added some tips in the post above. Put the water, sugar and yeast in the pan of your bread machine. Let the yeast dissolve and foam for 10 minutes. If it doesn't foam at all, you may have yeast that is no longer active. Get fresh yeast and start again. Add the oil, flour, and salt to the yeast. 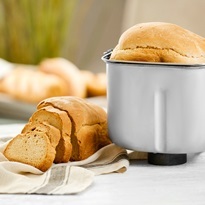 Select the Basic or White Bread setting (for a 1½-pounce loaf) on your bread machine and press Start.